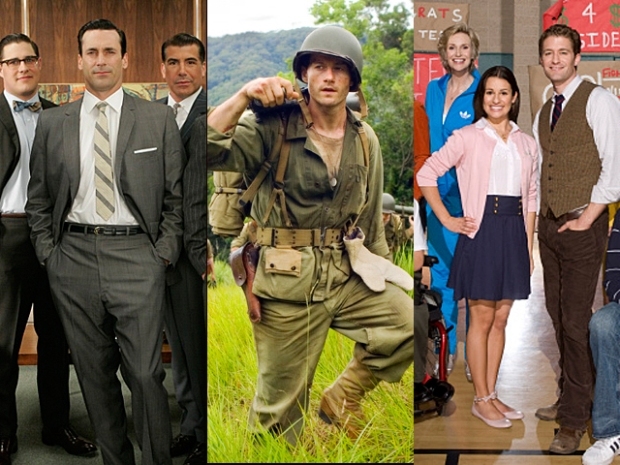 THOUGHTS: Just looking at the major nominees tells you what a strong year it was for televised drama. “Mad Men” was unfathomably brilliant in its third season, and many think this season of “Breaking Bad” even trumped THAT. “Dexter” and “True Blood” also hit their stride, and “Good Wife” was a major instant hit for CBS. I really hope “Lost” doesn’t win it as some kind of sendoff this year, because most everything here bested it. THOUGHTS: I’m of the mind that “Modern Family” deserves to win this, but I suspect Emmy voters know they can reward it somewhere further down its run. “Glee” practically needs it own category, or the Emmys could just turn this into a comedy/musical category, as the Golden Globes do. Because when you think of comedy, you think of musicals. If you’re an 80-year-old woman living in Long Island City. They may give “Glee” the prize because they know it could easily run out of gas soon. I’m crushed “Parks And Recreation” didn’t make the cut here. It was the year’s best comedy. THOUGHTS: Hey, they remembered Connie Britton! Nice. I think Margulies takes this one home. Also, I’m getting tired of seeing Hargitay posing with her kid in tabloid magazines. She’s secretly one of the bigger media hogs in Hollywood. THOUGHTS: Hamm really deserves it this year. I should be completely disgusted with Don Draper. But there he was at the end of this season, starting a new ad agency, and I was openly rooting for him to screw over his old colleagues. How did Hamm do that? It can’t be on looks alone. Can it? It is? Dammit. By the way, I like how the Emmys have sneakily upped the number nominees to six in all these major categories. They’ll have 10 in each by 2017 and you won’t even notice. Take note, Oscars. THOUGHTS: Fey has won this award ninety times, so either Emmy voters will lazily check off her name, or they’ll go for Michele just to mix things up. Louis-Dreyfus gets a nice sendoff for her work in the canceled “Christine.” A consolation prize of delicious Healthy Choice frozen dinners awaits her. THOUGHTS: “Monk” is still on the air? Really? Nick Offerman of “Parks and Recreation” was absolutely robbed here. THOUGHTS: I’ll be rooting for Slattery, right after I light up this delicious Lucky Strike cigarette. THOUGHTS: Keep an eye out for Baranski, who got tons of good notice for her role on “Good Wife.” Also, she was awesome in “The Ref.” Remember that flick? Loved it. So those are your nominees. Feel like someone got snubbed? Can’t live with the idea that Leighton Meester didn’t get her due? By all means, vent away in the comments.